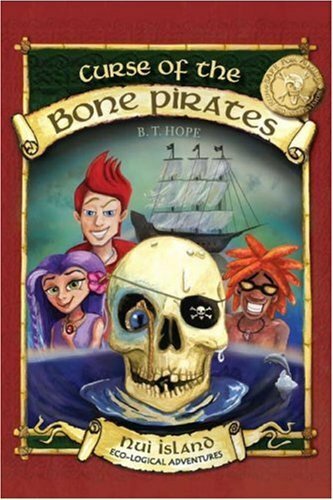 When my daughter (the avid reader) saw Curse of the Bone Pirates: Nui Island Eco-Logical Adventures by B.T. Hope sitting beside my computer this morning, she asked, “What is that?”. The cover intrigued her. The subtitle of “eco-logical adventure” intrigues me. When Big B is dragged from his comfortable life and close friends in Chicago by his grandfather s mysterious affliction, he s sure he s going to have the worst summer ever. But soon after arriving in the tropical paradise of Nui Island, he is caught in a web of danger and intrigue. The Ma’ema’e reef is dying, his grandfather s brilliant mind has been infected, and creepy Island legends are coming to life. Big B and his new friends, Sam and Nalu, rely on logic, intuition, courage, and strength to unravel Nui’s ancient mysteries. What they uncover will help them save the island, restore his grandfather’s soul, and break the curse of the Bone Pirates. With a captivating plot, fascinating characters, and an important ecological message, Curse of the Bone Pirates will haunt and delight young readers. The book’s entertaining and well-paced: I didn’t want to put it down. That might seem at odds with a work that also defines itself by its environmental message, but Machovino and DiCiccio do a very nice job of weaving these elements naturally into the story. Big B’s grandfather, Professor Prune, has created his home around closed loop and natural systems, so topics such as composting and natural building work right into Big B’s adaptation to his new setting. The authors also challenge their readers with complex subjects: biomimetics and evolutionary biology, for instance, appear in certain contexts. They don’t, however, make the mistake of having characters go into lengthy discourses on these subjects: they give just enough information so that a curious young reader could follow up on the topic if s/he desired. As such, The Curse of the Bone Pirates achieves a really steady balance between an educational work and a really good story. There’s no greenie preaching: just details of living in an environment in which careful management of resources is necessary for a comfortable lifestyle. As you can probably tell, I have not had time to read this book cover to cover; however, in skimming chapters I find much that children today can relate to in the characters (like purple hair), as well as Shakespeare and etymology that give the content some meat. After my daughter (with blue hair) reads it, I hope I can encourage her to update this post with her review. Thanks for the mention, Jennifer! I really did enjoy the book – I remember thinking that I hoped it turned into a series.